Ilyan’s whole life has been building up to one purpose. Protect the Silna;3. He knows what he must do, and he has no doubt in his ability to do so. But when his father’s magic removes Joclyn’s mind from her body, he is left protecting the shell of the one person he loves. 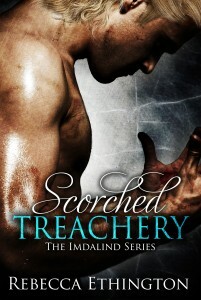 Desperate to find a way to break her free of her prison, he makes a choice. And that one choice changes everything. Now, Ilyan finds himself bound to Joclyn in a way that he never knew to be possible. They say that blood is thicker than water, but Black Water burns, and Ilyan’s heart may not be strong enough to keep it pumping through his veins and give the girl he loves back into his brother’s care. Even if he can, it may not be safe to do so.